This is a new book by Sally Melville. 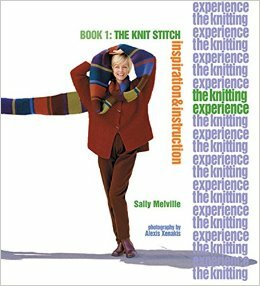 What an excellent book for both the experienced and beginner knitter. Hate garter stitch, this book is sure to change your mind. The Knitting Revolution? What`s revolutionary about knitting today is who is knitting (the new knitters are young women and retiring baby-boomers), what they are knitting (exciting yarns and projects), and most of all, why they are knitting (it feels good: the process, its creative and relaxing qualities, is at least as important to them as what they are knitting). What better time for a fresh approach to the learn-to-knit book?